Want to learn more about MAFE, and have lots of fun doing it? 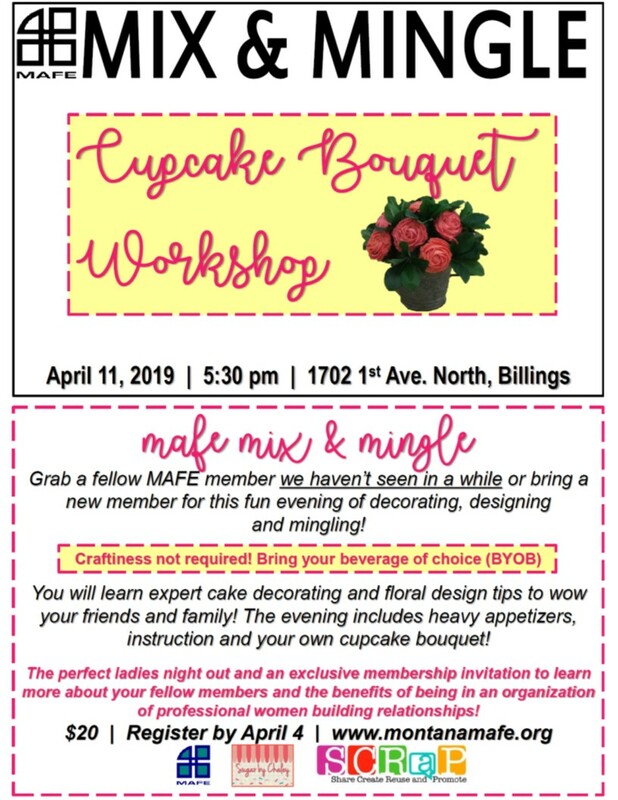 Grab a fellow MAFE member we haven’t seen in a while or bring a new member for this fun evening of decorating, designing and mingling! Craftiness not required! Bring your beverage of choice (BYOB).You will learn expert cake decorating and floral design tips to wow your friends and family! 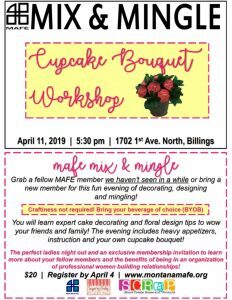 The evening includes heavy appetizers, instruction and your own cupcake bouquet! The perfect ladies night out and an exclusive membership invitation to learn more about your fellow members and the benefits of being in an organization of professional women building relationships! Click on blue link below for more information, or click on image to enlarge. Founded in 1980 in Billings, Montana the Montana Association for Female Executives (MAFE) is a dynamic association of professional women sharing the values of diversity, education, community awareness, leadership and networking. We are a group of professional women building relationships. MAFE provides a forum for women in leadership to exchange, ideas, experiences, goals and increase public awareness of the significant and diverse accomplishments of women. MAFE provides leadership opportunities for members to serve on the Board of Directors, as an officer, and through involvement in committees including: Membership, Public Relations, Programs, Accommodations, Networking and The Weekend Retreat. MAFE meets at Noon on the 2nd and 4th Wednesday each month at McCormick’s at 2419 Montana Avenue and lunch is $11.50. If you would like to explore our organization and attend one of our meetings please email: mafe.rsvp@gmail.com or call Sandy Vancleeve at 671-5055 by noon the Tuesday before the Wednesday meeting. MAFE lunch and networking events feature speakers on current topics and trends including: professional and personal development, management, economic, health, and community issues. The PayPal fees are included in your payment. Choose “Program Meeting” or “Renew Membership” options using the drop down box below. For Program Meetings, PayPal payment must be made by noon the Tuesday before the Wednesday meeting.